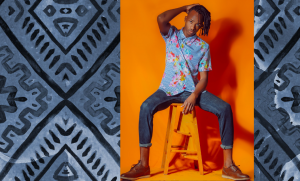 Designer Kapana Reviewed by Sibo Tshabalala on December 3, 2018 . 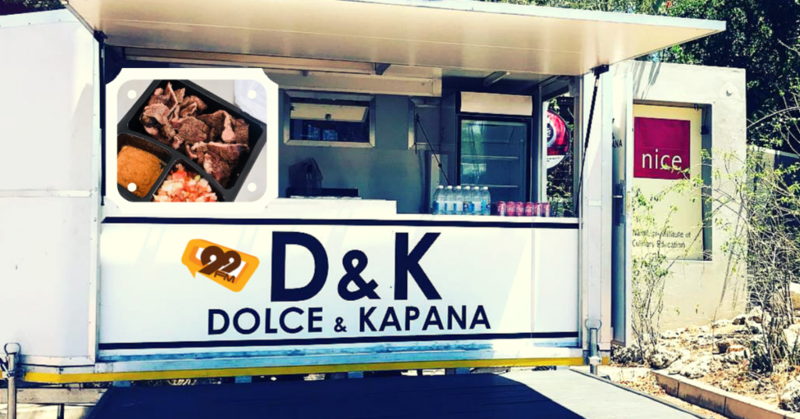 Dolce and Kapana, A kapana food truck. Food (brain) child of Hanso Diehl and Nabil Robiati. These two mavericks decided to put Kapana on the move and dubbed it #designerKapana. 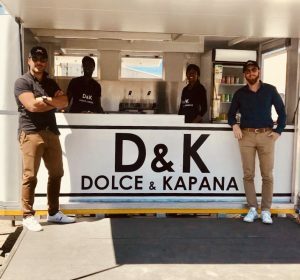 Why did you decided to name your business after a very famous brand, Dolce & Gabbana ? I don’t remember exactly how we came up with it, but we decided on the name the very first time we talked about starting a kapana business. We’re having fun with this name, it rolls off the tongue well and it plays well with our strategy of differentiating ourselves as #designerkapana! We realize that at some point Dolce & Gabbana might come after us legally since we’re so shamelessly ripping off their name. If it comes to that we’ll know that we made it and we’ll immediately change! I have no idea to what though. 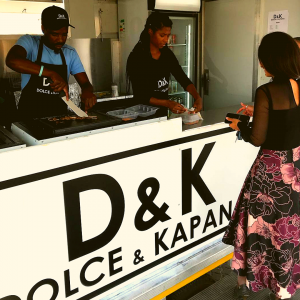 How did the idea of a kapana food truck come about? Both Nabil and I are serial entrepreneurs. We were brainstorming new ideas that got more and more outrageous, so we tried to come up with something that we know well and love, something that we ourselves consume but that is not conveniently available. Once we shifted our focus, kapana was a no-brainer. We knew that we had to do something comparatively fancy for the market we had in mind, but we weren’t prepared to spend big money to shop-fit something in a mall and commit to lease agreements etc. Eventually we settled on a trailer. 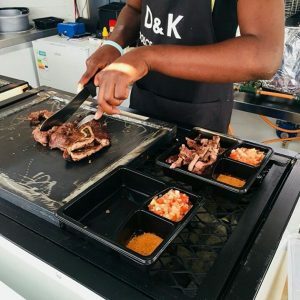 Kapana is a common dish, its part of the Windhoek urban culture, we all know which hotspots to go to when we want kapana. How have you penetrated the market? We want to make kapana easily accessible to anyone in Windhoek, for example people working in the CBD or living far from single quarters and Wanaheda. We also want to expand the market for kapana. We don’t want to compete with the kapana guys at single quarters – our market are the kapana lovers who would otherwise be forced to eat burgers, chicken or other take-away. Part of our appeal is that we use gas, not wood/charcoal. This allows our clients to get kapana for lunch without smelling like smoke afterwards. Our portions and prices are fixed, so there is no negotiation for every meal. Furthermore our trailer is equipped with three fridges so the freshness of the meat is safeguarded. 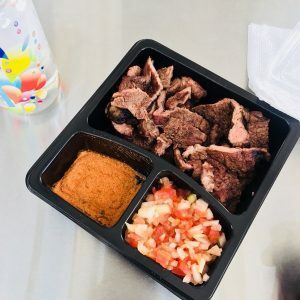 What has been some of the challenges you’ve encountered in owning a Kapana food truck? Any new business has unforeseen challenges, and even after a few days it became clear that we can improve on the layout on the next truck. 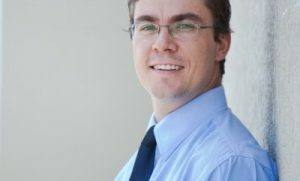 One of the main issues has been where to set up: Most locations we had in mind belong to the City of Windhoek and getting permission to use them is a long process fraught with red tape. We have now settled on the parking lot of NICE restaurant, which is not controlled by the municipality. 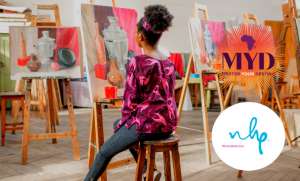 We are also doing many events on weekends, like the Jazz Festival and the Pop-Up Festival. Have you settled on just owning the food truck or are there plans in future in opening a restaurant? We have no interest in operating just one food truck. The vision has always been to grow Dolce & Kapana into a franchise business that will take on the South African/US fast food chains. Namibian beef is the best in the world, and kapana is a proudly Namibian way of eating it. We want to be at the forefront of promoting Kapana to take its place next to pizza, sushi and hamburgers in international cuisine. We’re gonna put Namibia on the map (again!). Hanso Diehl: born and bred in Namibia. Apart from being a kapana guy he’s in the transport business and is a partner in FitCity gym. Hanso is happily married to Roya with whom he has three kids. He has a borderline psychotic obsession with mountain biking. Nabil Robiati: Italian by birth, he has lived in Namibia for 15 years after marrying the love of his life Ndiitah. When he’s not cutting tomatoes for salsa he runs his food distribution company. He has two kids. In his spare time he likes to watch F1, or dance.